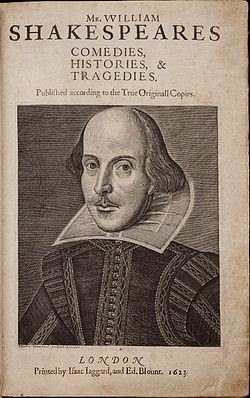 Last year I wrote a reasonably well-prepared post about William Shakespeare and his plays in celebration of his birthday on this very blog. Alas, this year, well, I’ve been a bit lax in gathering data and thoughts and such, so I may be a bit doddery (Lear creeps in already) in these scribblings. I will now stop procrastinating, for as Will said, “In delay there lies no plenty.” Or Good’n’Plenty. Off we go. The thing about Shakespeare is that we go to hear the words. We see the same plays over and over again because the same play can take a different path when someone new directs it or acts in it or designs it or thinks about it and puts it all together to communicate their interpretation to us, the willing audience. And if we disagree, we get to argue about it. Who could ask for anything more. We will see their spiffy production values and costumes and themes and such, but still we go to hear. Hear the same sentence sound remarkably different because a different actor is saying it to yet another actor. Let’s take King Lear, for example; it’s a year for Lears. There’s your Lear, and there’s your Lear talking to your Regan. 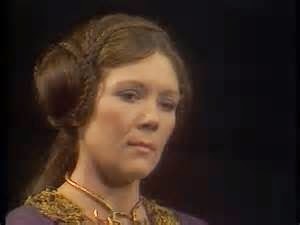 Or your Goneril. Or your Cordelia. And your Lear has different feelings about each of these daughters depending on the actor playing Lear, the actor playing Goneril, the actor playing Regan, the actor playing Cordelia. So many dynamics to play with, so many possibilities. And each time we hear this Lear we haven’t seen before speak the same lines another Lear did to his daughters, the words are new and fresh. Everyone wants to do Lear — the play has very fine male roles, of course, but also two excellent female roles and one possibly impossible female role — so there’ll be plenty more to come and to compare. All of this applies to many of the plays, of course. Lear is an easy example this year. Last month I saw Theatre For a New Audience’s (“TFANA”) production of King Lear in which Michael Pennington undertook the role of Lear under the direction of Arin Arbus. His Lear was a pretty angry fellow in full control of his faculties when he makes all the foolish assumptions and foolhardy decisions of his first scene. Later he goes a bit dotty and becomes softer and more understanding. He notices things then — things like there were subjects (people) to be cared for, to be protected, in his kingdom, and he hadn’t done his job well. It was a very socially-aware Lear. I’m told, although I didn’t see it myself, that Frank Langella’s Lear performed the month before at BAM, started off that same first scene practically doddering and then became clearer in his madness. Utterly different men, utterly different choices, utterly different relationships. In the TFANA Lear, my favorites were the Regan (a marvelously sharp and cynical Bianca Amato) and her husband Cornwall (a delightfully perverse Saxon Palmer). I decided to re-view a Lear still in my memory from the 1980s for its fabulous Edmund and Edgar pairing of Robert Lindsay and David Threlfall. The Lear was Olivier. The Fool, oh the Fool, was John Hurt! Next week I’ll be seeing a live broadcast from London of a production directed by Sam Mendes in which Simon Russell Beale takes on Lear. London’s Donmar Warehouse’s production of Julius Caesar1 set in a women’s prison transferred handily to St. Ann’s Warehouse in Brooklyn. 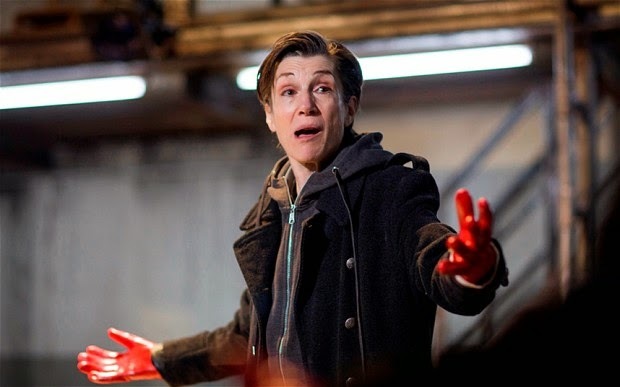 Directed by the fabulous Phyllida Lloyd, Dame Harriet Walter as Brutus and Frances Barber as Julius Caesar led an all-female cast to the heights and depths and yes it worked. This was the perfect example of familiar lines carrying all new meaning based on the interpretations of different direction, actors, genders, and styles. TFANA’s inaugural production in its new home in another part of Brooklyn was of A Midsummer Night’s Dream2 directed by Julie Taymor. It was as magical and delectable and high-flying as you might expect from Ms. Taymor. In addition to more snow than we’re accustomed to, winter brought us two plays in repertory3 from Shakespeare’s Globe, not in its usual visiting venue in lower Manhattan. Rather, these two gorgeous (costumes, set, music, everything), all-male Globe productions traveled to Broadway. - Twelfe Night starred Mark Rylance as Olivia in what might be the most extraordinary performance I’ve seen him give yet, and he’s always remarkable. Stephen Fry’s Malvolio was also delicious. - Richard III starred Mr. Rylance again in the title role, but the play showed itself as it is — so much about Richard that the other characters and the story are short-changed. Not by the actors, however. For just one example, Samuel Barnett (a fine Viola in the Twelfe Night) was a fabulous and powerful Queen Elizabeth in Richard III. At a movie-house I saw the Donmar Warehouse’s production of Coriolanus4 broadcast live from Covent Garden, London, to Kew Gardens, Queens. The live broadcast was almost as exciting as being there live to see Tom Hiddleston’s performance as a youthful and disdainful Coriolanus. It was an interesting production of a problematical play. And, to follow up, I also watched the Ralph Fiennes film version. Two views of Coriolanus in one year is quite unusual. 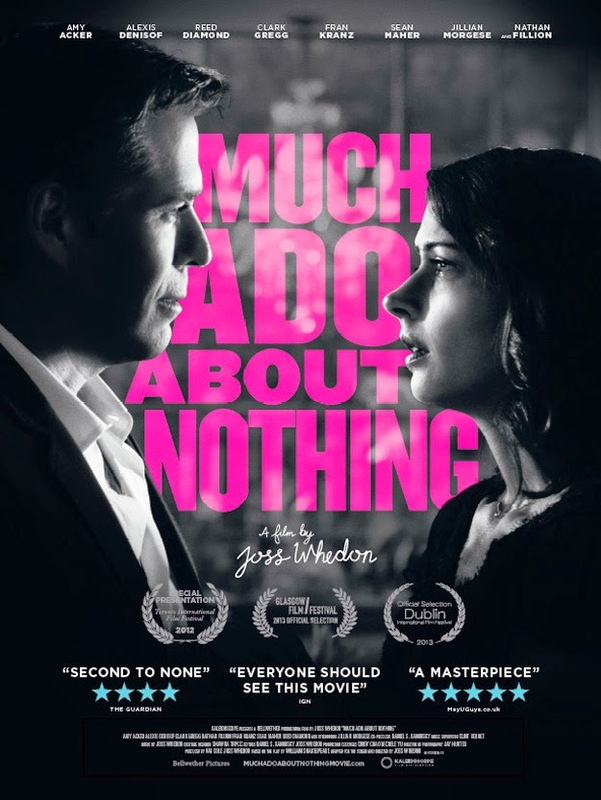 The long-awaited Joss Whedon black-and-white modern day Much Ado About Nothing5 opened on a rainy night last summer. It was fun, and there were some delightful performances, but the mores and manners of Much Ado do not lend themselves well to modern settings, in my opinion. 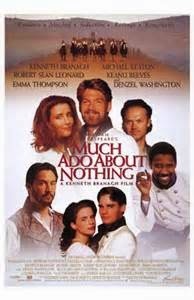 Viewing that film did, however, inspire me to re-view Kenneth Branagh’s 1993 film of the same play, which was a polar opposite to the Whedon film. It’s all a matter of interpretation, not to mention mood. How far afield can one go in interpreting Shakespeare’s words? From The Tempest played on an Elizabethan stage in which the sea and sand and cave are all artfully explained in poetry because they cannot be physically brought into the old Globe, all the way to a science fiction film that introduced Robby the Robot as a sort of Ariel and Dr. Morbius as Prospero, with Anne Francis — in remarkably skimpy outfits for 1956; there is clearly nothing new under the sun — as Miranda on the planet Altair IV instead of a desert island. Shakespeare: Passport to the Universe. Among my theatre goings this year, I saw an interesting new play that echoed themes of A Doll’s House, which I also saw this year in an excellent production directed by Carrie Cracknell with Hattie Morahan as Nora. But I won’t be seeing either of those plays again. It’s Shakespeare that bears repeating, that we go to year after year, wondering how will that director show it, that actor interpret it, what will it look like to an audience that can never get enough of Shakespeare. How will it sound this time? 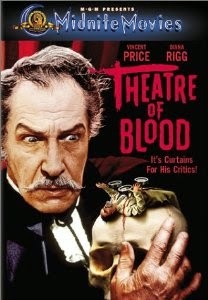 Right now, for mood music, I’ve got a DVD of “Theatre of Blood” playing in the background — the story of a Shakespearean actor who decides that first he must kill all the critics, all by methods found in the Bard’s plays. Vincent Price, Diana Rigg — full of Shakespearean quotes and plots and a cavalcade of British actors of stage and screen. Such fun. By the way, Michael Graves, an old friend from my acting days, moved down to New Mexico, and he is right now rehearsing his first Lear for a reading at the Aux Dog Theatre. Anyone anywhere near Albuquerque, please go see him on Thursday for me and continue this Lear year (http://www.auxdog.com/shop/index.php?main_page=product_info&cPath=60&products_id=502 ). Happy Birthday, Will. Many exciting returns of the day. And thank you for your never-ending gifts.